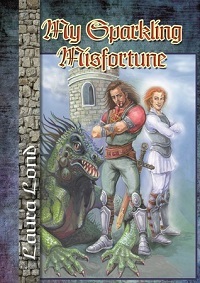 In what has to be the most unique and clever middle grade fantasy that I have encountered in a long while, Lond’s first installment in her Lakeland Knights series is told from the villain’s perspective. Arkus is the villain, and he’s actually a pretty bad one: his attempts to gain the upper hand by capturing an evil spirit to do his bidding is foiled when he gets an overly optimistic, cheerful and good natured ‘sparkling’ who is now bound to him for five years. Arkus is wholly enamored of the ‘bad boy image’ he is struggling to put forward, yet his every slip into less than villainous behavior results in fulsome praise by his indentured sparkling. A quest to end all, with his own nefarious turn on events to give him the upper hand, there is action and fantasy aplenty to keep readers and listeners interested and wanting to know what comes next. Narration for this story is presented by A. T. Chandler, who manages to imbue Arkus with a touch of the over-blown cartoon villain, the sparkling with a lilting irish brogue, and the other voices with qualities that suit both their position and age, and never seems to miss a trick. I wasn’t sure at first if I would like the voices, but there is, as the story proceeds, a feeling that Arkus is struggling to keep the mask of the villain voice even as he is sensing (to his distress) tat he is changing for the good. Clever insets as he tells us he is using sarcasm or scorn that doesn’t quite reach the voice, it is clear that Arkus is very invested in his image, and will have difficulty releasing his stranglehold.